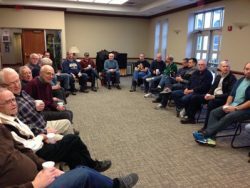 In 2019, our Associate Pastor Vinod Kumar, along with Deacons Brennan, Grossnickle, Madison, Onischuk and LeTourneau begin the 9th year of the OLW Lenten talks for men. All men are once again invited to attend a Lenten Series of Reflection, Prayer and Challenge every Saturday morning during the Lenten Season. The 40 Days of Lent provide Men of Faith an excellent opportunity to Walk with Christ, Learn from Christ and Pray with Christ. Join Fr. Vinod Kumar in the Gathering Space for one hour every Saturday during Lent (March 9 through April 13, 2019). Reflect, refuel, and reinforce your Christian life! Fellowship, Coffee and Munchies in the Gathering Space from 7:20 a.m. – 7:35 a.m.
Talks/Interaction in the Gathering Space from 7:35 a.m. – 8:25 a.m.
A Communion Service following at 8:30 a.m. in Church. Men 18 years of age and older welcome to attend. Fathers are welcome to bring their teenage son(s), but talks are geared toward adult men, not teens. Click here for our 2019 Photo Gallery.